When we arrived in the USA (10 weeks ago! 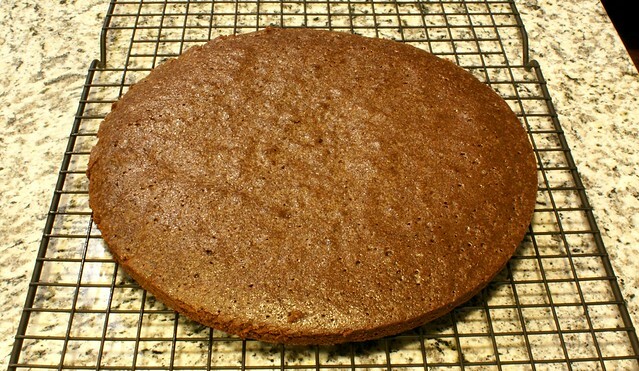 ), I was getting frustrated with shopping for food, especially baking items. I had been confused in the baking aisle many times as I just couldn’t find what I wanted and then gave up 😦 I made some buns using a ready mix but they didn’t taste like my baking so I didn’t like them! I came home and took to the internet to find the US equivalents to icing sugar, caster sugar and the flours that are used in baking. I felt much better once I had made a list and was ready to tackle the baking aisle again. Success…woohoo! I came home with ALL of the ingredients that I wanted. 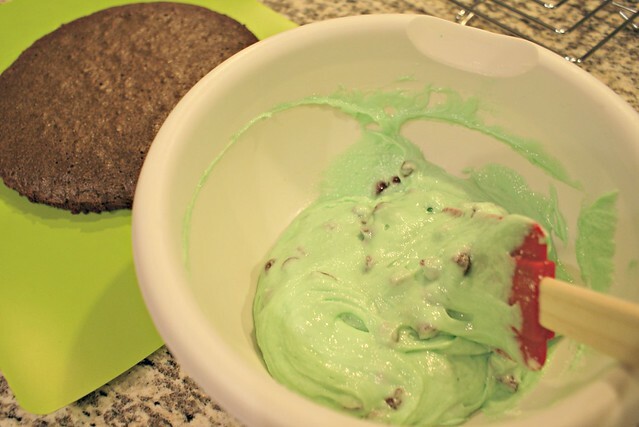 The first thing I wanted to bake were these Peppermint frosted fudge brownies. The recipe appeared to be straight forward and it was! The brownie mixture came together perfectly and it was lovely to smell a homemade mixture. Yes, there is a difference between homemade and shop bought mixture smells! I didn’t have a square tin so I used a cake tin instead. For this reason, my brownies looked just like a chocolate cake and I was a little disappointed. 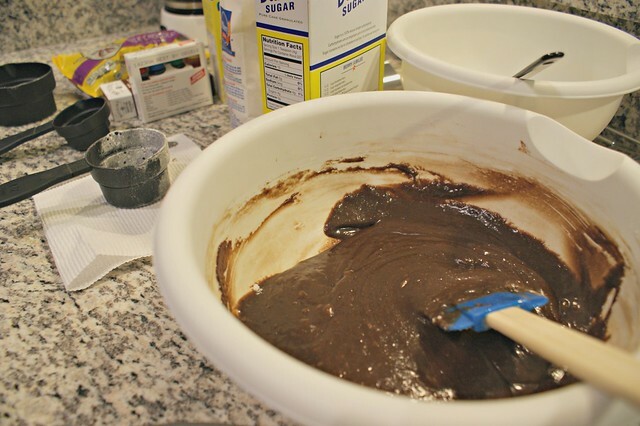 Chocolate cake wouldn’t have been bad…but I was making brownies! Anyway, I persevered without tasting any before they were complete. I loved making the frosting/icing…the peppermint smelled delicious! I had never used peppermint extract before so I’m sure that you can understand my excitement! Looks yummy! I quite often make brownies, theres nothing quite like the taste of a homemade batch isn’t there! I’d never thought of doing a topping like that, but actually it sounds quite yummy, I might have to try it! Looks delicious! And congrats on figuring out the baking aisle. I’m always amazed at how different two different dialects of English can be, it sometimes feels like speaking two different languages. I know… I definitely didn’t think that it would be as tricky as it has been! I just laugh it off most of the time but Adam gets very frustrated as he has a very broad Yorkshire accent! Yes they are just like After Eight’s! It’s a recipe from Pinterest, really easy too! These look sooo good with that icing!!! Will have to try them! Mmm, these look delicious! Pinning. Thank you for sharing at Merry Monday!